A boy with an extremely weak immune system is using a robotic avatar to substitute for social interaction. Lyndon Baty, a young man from Knox City, TX, has battled polycystic kidney disease for his entire life, leaving him with almost no immune system, but his schoolmates wouldn't know that. Actually, they would, because Baty has been using a robotic avatar to experience the world as someone in his position would never be able to. 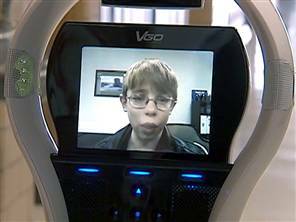 Baty sends a robot called a VGO to school, which wheels around, takes real-time video and audio of its surroundings, and in turn allows Baty to communicate with those in its environment through video chat. Before the VGO, Baty's best friends were his parents, because he was unable to go anywhere but home or the hospital without risking his life. Now, Baty can interact with his friends in a way he never thought possible. "It's absolutely amazing," he told NBC. "I would have never thought when I was sick that I would ever have any interaction, much less this kind. It is just like I am there in the classroom." The Knox City Independent School District happened to get a call from a salesman with VGO Communications that asked if it'd like to take a look at the product. The $5,000 cost (with 8 hour battery life) seems to be negligible for the benefit that it has provided just a single student. Baty's mother says the VGO gives her son a "reason to get up." Getting to interact with people in a more realistic way through the robotic avatar has made it so that Baty anticipates the morning bell. He's probably the coolest kid in school, too. The VGO reminds us, just in case we forgot, that we're living in the future. Fast-forward 20 years, and I bet schools and workplaces will be filled with more VGOs than humans.